Is there an easy way to check if a binary is 32 or 64 bit on Windows? I need to check before I move the program to a 32bit machine and experience a spectacular failure. After examining header values from Richard's answer, I came up with a solution which is fast, easy, and only requires a text editor. Even Windows' default notepad.exe would work. Open the executable in text editor. You might have to drag-and-drop or use the editor's Open... dialog, because Windows doesn't show Open with... option in context menu for executables. Check the first printable characters after the first occurrence of PE. This part is most likely to be surrounded by at least some whitespace (could be a lot of it), so it can be easily done visually. A word of warning: using default Notepad on big files can be very slow, so better not use it for files larger than a megabyte or few. In my case in took about 30 seconds to display a 12 MiB file. Notepad++, however, was able to display a 120 MiB executable almost instantly. 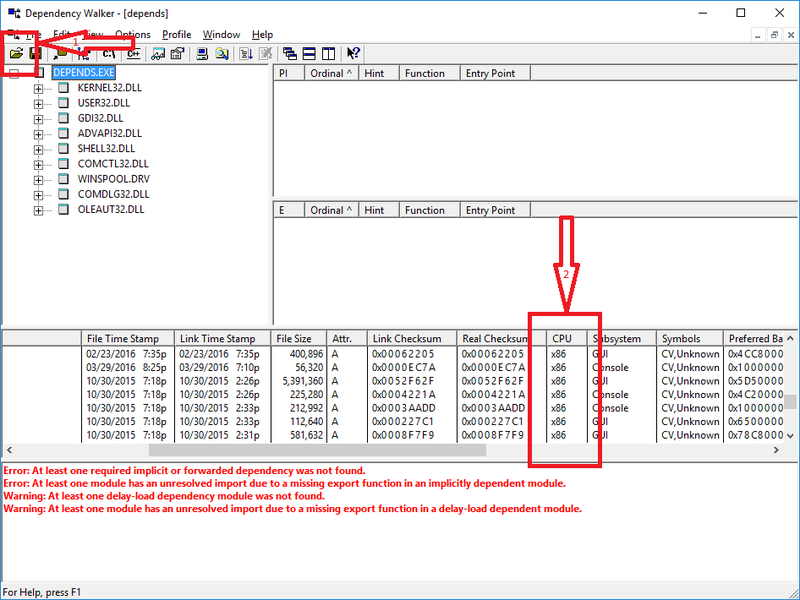 This is solution might be useful in case you need to inspect a file on a machine you can't install any additional software on. If you have a HEX-Editor available, the offset of PE Signature is located at offset 0x3C. The signature is PE\0\0 (letters "P" and "E" followed by two null bytes), followed by a two byte Machine Type in Little Endian. The relevant values are 0x8664 for x64 executable and 0x14c for x86. There are a lot more possible values, but you probably won't ever encounter any of these, or be able to run such executables on your Windows PC. Full list of machine types, along with the rest of .exe specifications can be found in Microsoft PE and COFF Specification Machine Types section. As you can see, it's very obvious which is which. Additionally it distinguishes between console and GUI executables, also obvious which is which. A simple method is to run it (assuming you trust it) and take a look at the process tab in task manager. 32bit processes will show "* 32" at the end of the process name. 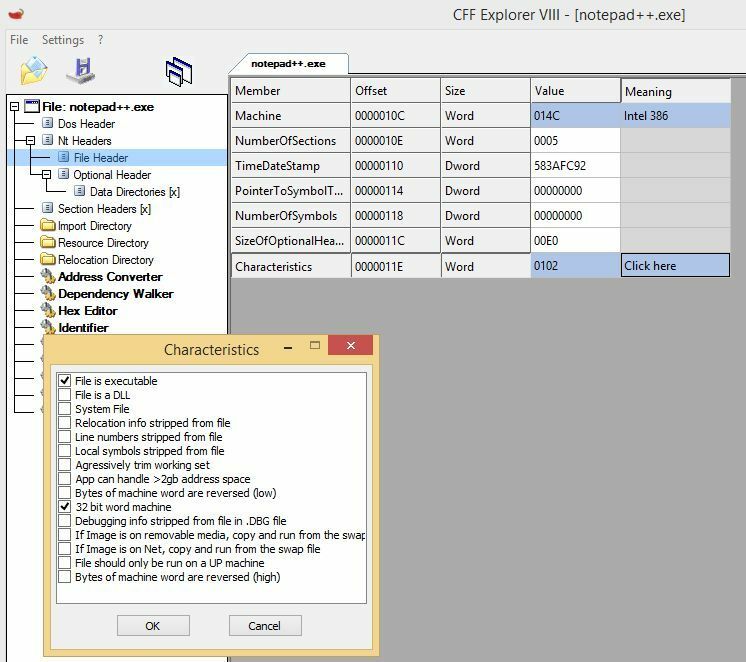 If it's not something your willing to run on your computer you can try EXE Explorer. It will show a whole bunch of info on executables including if it's 32 or 64bit. 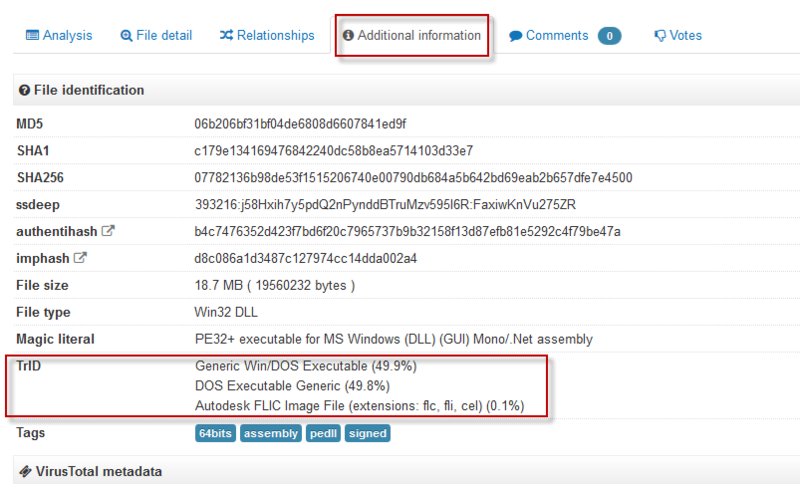 The 64-bit version of Process Explorer can tell you. Simply run the executable and open the process's properties window. 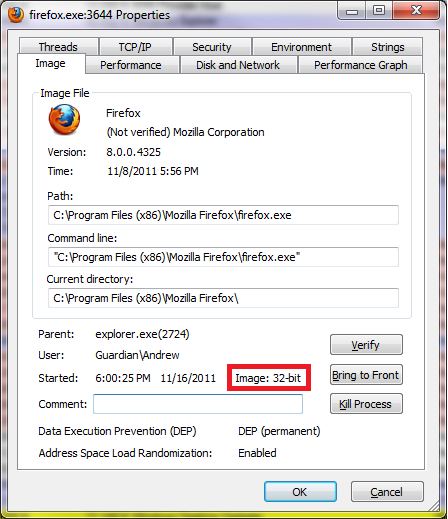 On the main tab there's an entry which says "Image:32 Bit" or "Image:64 Bit". I find that Virustotal File detail is the simplest way to find out if a binary is 32 bit or 64 bit. The Additional information option provides in addition much helpful informations about the file. We have to execute the process. For the short lived processes (like echo hello world types. ), process explorer might not even register that a new process has started. Dumpbin.exe method can solve the purpose probably. Another alternative would be to use cygwin's file command. However, I have not tested it on windows. It works well on Linuxes. 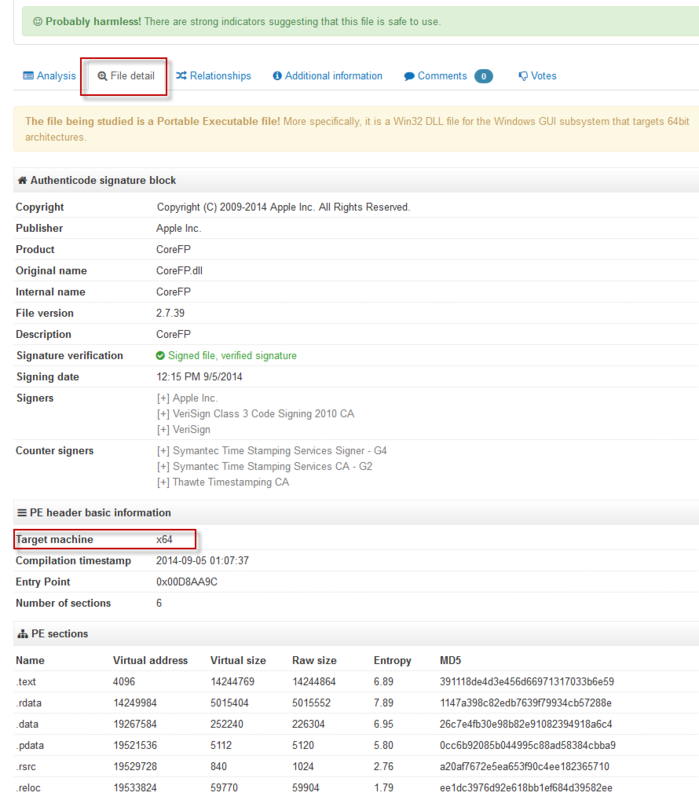 Even an executable marked as 32-bit can run as 64-bit if, for example, it's a .NET executable that can run as 32- or 64-bit. For more information see https://stackoverflow.com/questions/3782191/how-do-i-determine-if-a-net-application-is-32-or-64-bit, which has an answer that says that the CORFLAGS utility can be used to determine how a .NET application will run. you can also use the file tool from within the msys bundle of mingw. It works like the unix command. Similar works the file tool from GNUwin32. If you are on Windows 7, on a Windows Explorer, right click on the executable and select Properties. At the properties window select the Compatibility tab. If under the Compatibility Mode section you see Windows XP, this is a 32 bit executable. If you see Windows Vista, it is 64 bit. rem from bytes in 0x3C-0x3D position. if ucase(hex(asc(mid(FirstChars,AddrFinal+4,2)))) = "4C" then Wscript.Echo Filename & " is a 32 bit executable." if ucase(hex(asc(mid(FirstChars,AddrFinal+4,2)))) = "64" then Wscript.Echo Filename & " is a 64 bit executable." It will appear as "32/64 bit test" in context menu upon right clicking on an executable file. Clicking the item will result in starting batch file c:\\temp\\x86TestStart.bat\, which starts VBscript file x86or64.vbs , which reads exe signature and shows result. If you cannot or don't want to tamper with registry, just copy the .vbs file in QuickLaunch bar, and drag executable over it. My two cents will be just download dependency walker and check what for architecture has been used in one of the executable file. I haven't seen this mentioned. There is a PE viewer program called CFF Explorer by NTCore, which can provide you this information. It can be downloaded and run as portable, but you can install it as well, if you wish. Right click on the binary (.exe, .dll etc.) and select "Open with CFF Explorer". Go to Nt Headers -> File Header -> On the "Characteristics" field click "Click here"
If it's a 32bit program, the checkbox "32 bit word machine" will be ticked. For instance, i have installed the 32bit version of Notepad++ as you can see in the image below. Otherwise, it's 64bit. Yet, WSL's file command works greatly. Not the answer you're looking for? Browse other questions tagged windows binary-files 32-vs-64-bit or ask your own question. On Windows 7, how to check that applications are in the correct Program Files directory? USB stick with Windows 10 Home. How can I tell if it was created for 32-bit or 64-bit? How to check whether my OS is 64-bit or 32-bit? How to write the path of a 32 bit executable in the Windows' Program Files folder regardless of the Windows version? How can I create a 64-bit Windows 7 USB installer in a 32-bit environment? How do binary files run on different machines? Change Windows 7 64 bit to 32 bit to run legacy programs?